Mismatched bridesmaid dresses have been the go-to dress theme for weddings for the past few years. Gone are the days of matchy matchy styles, brides wants their girls to have a say in their individual style. How do you find that happy medium in letting your bridesmaids choose their dresses, but still have their looks coordinate together. 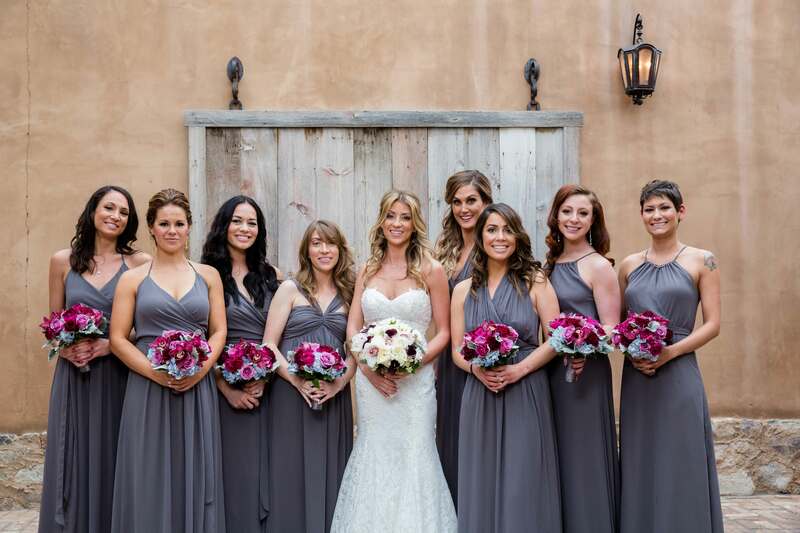 Bridesmaid dresses can be very different, but still coordinate together if they share a common element. The common denominator can be the dress color, fabric, silhouette or neckline. Choosing the same dress designer for your bridesmaid dresses might also help the looks coordinate since most designers keep things consistent in their collections. 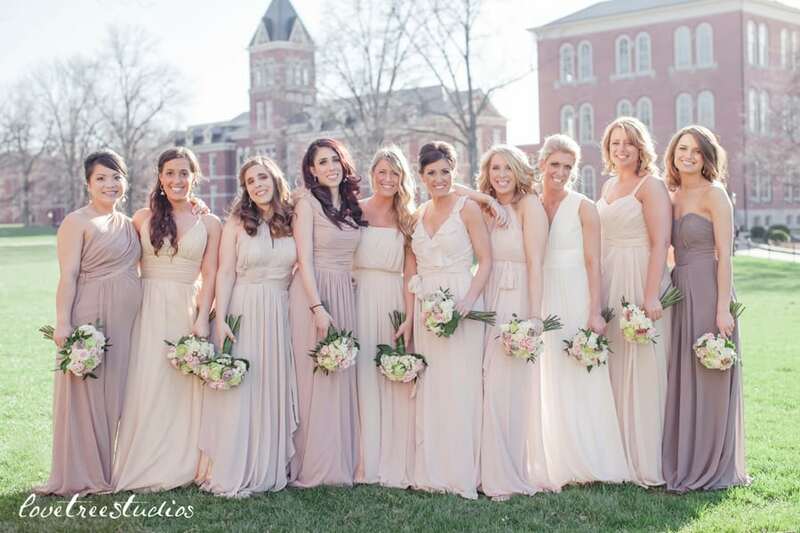 Asking your bridesmaid to choose a blush pink or gray dress may sound easy enough, but if you don’t guide them in their dress choices you could end up with uncoordinated mismatched bridesmaid dresses. Appoint someone such as your maid of honor, or yourself, to approve the dress selections to make sure they coordinate and look photogenic together. If all your bridesmaids choose floor length dresses except for one, your photos will look inconsistent. Or if everyone chooses a strapless dress, but one bridesmaid wants a dress with sleeves, this will stick out in your photos. Try to keep their dress choices consistent. Have everyone go with the same silhouette or half of the girls choose one dress style and the other half choose a different style to keep things looking coordinated. Have the same bouquets and accessories. Having your girls wear mismatched bridesmaid dresses means everything else should be the same. That goes for their bouquets, shoes and accessories. Too many mismatched items will make your photos look messy. By keeping their accessories consistent, this will pull all of their separate looks together. We have more wedding style advice on our blog.